American Wine Laws: Time for a Change? Only in America? 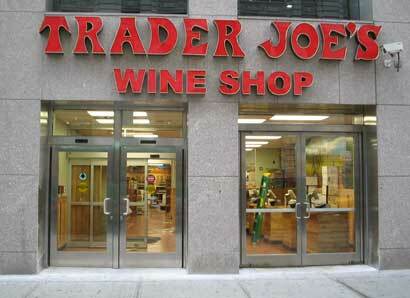 You can't buy food at this NYC Trader Joe's wine store. And you can't buy wine at the Trader Joe's next door. A European visitor pulled me aside recently to complain about American wine laws, which considerably restrict the what, where and how of wine sales and consumption compared to more relaxed European practices. “I thought there was separation of Church and State in America,” he said, showing that he hadn’t forgotten what he learned in Civics class years ago as a high school exchange student in Cleveland. He put the blame for America’s wine parochialism squarely on the influence of conservative religious groups. Religious groups are political powerful, I told him, and they no doubt have had some influence on the development of America’s wine laws. But that’s not the reason the laws don’t change, I said. It is the interests of those who gain from the current set up. He wasn’t convinced. He seemed to think that a moral explanation was inherently more persuasive (or more American?) than an economic one. But I still think I’m right. My explanation — that economic forces organize around any set of regulations, become entrenched and use their political and economic clout to prevent change — has a good economic pedigree. It is the theory of structural rigidities developed by Mancur Olson in his two classic books, The Logic of Collective Action and The Rise and Decline of Nations. Olson’s theory is elegantly simply. Restrictive economic arrangements benefit a small number of actors a great deal, so they have a strong incentive to organize and fight change. Eliminating the restrictions benefits a larger but widely diffused set of actors who have correspondingly smaller individual incentive to take action. Even though the collective gain from liberalizing arrangements is likely to exceed the collective loss, the concentrated established interests have more of an incentive to influence legislators and regulators than the general public. This is why regulations, once enacted, are difficult to change. Public gain cannot seem to trump concentrated private interests. Olson developed this theory in The Logic of Collective Action and used it in The Rise and Decline to explain why rich, stable economies sometimes experience slower growth rates. Stability allows interests to become entrenched and structural rigidities to solidify. Change becomes more and more difficult and potential collective gains from innovation are systematically sacrificed on the altar of vested interest. Every once in a while, Olson argued, advanced nations need something that will shake things up and weaken the grip of special interests. Then all sorts of change becomes possible. An article by Graham Rayman in the August 11, 2009 Village Voice provides evidence to support this theory. New York is one of 15 US states where it is illegal to purchase wine or beer in a supermarket (and you can’t buy bread or cheese in a NY wine shop, either). It isn’t so much separation of Church and State as the division of Wine and Cheese. Supermarkets can sell wine, beer and spirits as provided by the law, and some do this, but they must have separate stores with separate entrances, checkout stands and so forth. Two doors, two lines, two sets of store staff. Greater legal control alcohol sales is possible, I suppose, but at a considerable sacrifice in convenience. It is probably not a surprise that wineries and wine enthusiasts would want to change this, but it isn’t an easy thing to do. The Village Voice article explains how liquor store interests organized and lobbied the NY legislature to kill a recent bill that would have permitted supermarket sales. The main force behind the proposal was the state government’s need for revenue — the state projected that increased sales though supermarkets would have added to state tax coffers. The story focuses on the anti-reform lobby — it would be interesting to know more about than the author reports here about how supermarket chain and corporate wine producer interests reacted to the bill. But the point about the blocking power of small but concentrated interests is well made. Supermarkets are just one distribution vector for wine, of course, and New Yorkers have many competitive specialist stores to keep prices down and service up, so we don’t need to feel too sorry for them. But it does seem that the increased convenience of grocery store sales would help expand the wine market and promote wine as a lifestyle choice. It’s too bad the reform effort failed. The inconvenience of wine buyers in the 15 supermarket-ban states is important, but the grip of special interests on wine regulations extends to other areas.The cumbersome three-tier distribution system and restrictions on inter-state wine shipments are two other areas where entrenched interests have successfully fought off liberalization efforts.The result is the restrictive system my European friend finds so difficult to understand. If Mancur Olson is right, restrictive regulations will be difficult to change unless something happens to shake things up. Maybe the economic crisis, which has put every link in the wine value chain under stress, will ultimately provide just such an opportunity. Consumers, wine producers and even state tax departments all have something to gain from changing the system now. I told my European friend not to hold his breath waiting for wine reforms to trickle up from grassroots wine enthusiasts. The real hope is that the big players will push for liberal reforms. Personally, I pin my hopes on Costco, the largest single wine retailer. And I wonder if Wal-Mart will get involved now that it is selling wine in many stores (it even has its own version of a Two Buck wine called Oak Leaf). OK, Wal-Mart is a long shot, given its Arkansas roots, but these are unusual times — almost anything is possible. The New York defeat is a definite setback (and the California plan to increase wine taxes is a step in the wrong direction) but maybe European-style wine market regulations are an idea whose time has finally come. Interesting article in the New York Times about Whole Foods’ failed attempt to open a wine shop in New York City. Whole Foods learned the hard way that opening a wine store in New York is not easy. The wine shop at its market in the Time Warner Center was closed by the state liquor authority because the shop was deemed part of the supermarket; state law bans selling wine in food stores. Then Whole Foods’s license request for a wine shop near its store in the Bowery was denied because of community opposition. But the company succeeded in starting a wine store in the same building as its newest store on the Upper West Side: it opened on Aug. 24, and the supermarket will open on Aug. 27. Yellow Tail is the best selling imported wine in the United States. Yellow Tail accounted for 11 percent of all U.S. imports in 2005. This one wine brand represents about 8 percent of all Australian wine production and 15 percent of that country’s total wine exports. Yellow Tail sells more wine in the U.S. than all French producers combined. This is an aerial photo of the winery, which is located in a small village called Yenda in the Riverina region of South East Australia. If it doesn’t look like a quaint little craft winery it is because the volumes are so large. 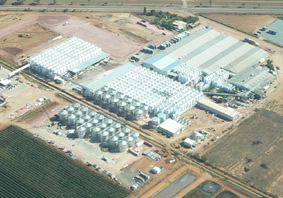 The warehouse structure in the upper right corner can store 900,000 cases of wine at a time, according to Wine Business International. The bottling line next door is the fastest and loudest in the world, filling 30,000 bottles per hour (two more lines are planned to increase capacity). Total production is about 11 million cases, of which about 8.5 million are exported to the United States. It is a sophisticated factory, with blending facilities that assure that each bottle tastes just like the one before. That differentiates it from Charles Shaw wine (a.k.a. Two Buck Chuck), the Trader Joe’s wine, which people say can vary considerably from case to case. Yellow Tail is expanding in every imaginable way: more varietals (an Australian Pinot Grigio), a Reserve line of wines sourced from cooler-climate vineyards and now sparkling wines, too. 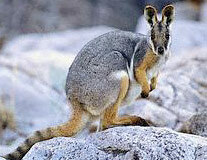 The Yellow Tail’s distinctive yellow-footed rock wallaby “critter” is everywhere. Yellow Tale is a phenomenon, but not one you will read about in the supermarket wine magazines. They don’t waste much ink on wine that costs about as much per bottle as the magazine itself does per issue. Magazine? Bottle of wine? It’s easy to tell which one the Yellow Tail customer will purchase! So I’ve been trying to find out more about Yellow Tail and here is my report. The interesting thing about the Yellow Tail success story is that it can be told in several different ways. This is not unusual in my experience. Stories of success and failure are frequently spun into meaningful narratives to try to make particular points. One version of the Yellow Tail story, for example, focuses on family and the importance of family businesses in the wine business. This Yellow Tail Tale begins with the Casella family, winemaking immigrants who came from Italy in the 1950s and eventually planted their own Australian vineyards in 1965, selling grapes under contract to larger producers. Keen to make their own wines and export them, Casella invested in production facilities in the late 1990s and started looking for ways to crash the emerging U.S. wine party. The key event in this version of the story is the alliance that was struck between Casella Wines Ltd, an Australian family business, and an American one, the William J. Deutsch company. Deutsch is a major U.S. wine distributor — they helped make the French Georges DuBoeuf wines a major U.S. brand — and they were willing to take a chance on an unknown Australian wine with a clever label. A partnership was established, with each family firm owning half of the Yellow Tale brand. Casella made the wine, Deutsch sold it. U.S. sales soared, from about 60,000 cases in 2001 to more than 8 million cases today. Why was Yellow Tail so successful? One theory is that it is family and trust that are the key elements and that the cooperation and commitment that Casella and Deutsch have demonstrated would not have been possible if either of them had been a public corporation, beholden to shareholders and driven to meet quarterly profit targets Family is the key to Yellow Tail. A second group of business analysts have also appropriated Yellow Tail and made it the basis of a wholly different narrative, this one told using some unfamiliar jargon (unfamiliar to me, at least). Here is the Yellow Tail story told in terms of Blue Ocean versus Red Ocean. The oceans in question are markets. Blue Oceans are markets for new products. Red Oceans are markets for existing products. Why are they red? I don’t really know but based upon what I saw last summer on the Discovery Channel’s “Shark Week” I’m willing to guess that existing markets are a tough environment to enter. You’ve got to compete with well-adapted predators who will cut you up badly if you aren’t really strong (Red Ocean = bloody ocean — get it?). A Blue Ocean, on the other hand, is uncontested open water. You’ve got a much better chance of profit if you can stake out the market for a new product before the competition gets there. So how is Yellow Tale a Blue Ocean product? According to one article it is because Yellow Tail isn’t wine as we know it — it’s a whole new thing. The Wine Business International article cited above provides the details. People don’t really like wine, the article suggests. Even the Casellas don’t like it (is this possible?). It’s very tannic and acid and people aren’t used to those qualities except in tea. Who wants to pay $6 a bottle for something that is bitter and sour. The key to Yellow Tail was the realization that wine without tannin and acid could be very appealing, especially to the majority of Americans who really don’t like wine. (It was designed to appeal to the 85% of non-wine drinkers, according to the article, while not offending the 15% who already like wine. That’s 100%, if my math is correct. No wonder it is so popular). Yellow Tail isn’t as strong a brand in Great Britain — maybe it’s because the British actually like wine, acid tannin and all? The Red Ocean, then, is the market for wine and the Blue Ocean is the market for wine that doesn’t taste like wine. (You might call it the Blue Nun Ocean in honor of a popular semi-wine wine of the 1970s.) If this analysis is correct, then you can see why Yellow Tail is such as success. But you can also see why its success might be short lived (and why, therefore, Casella may be moving into other markets). The Blue Ocean of semi -wine was quickly populated by competing predator species. 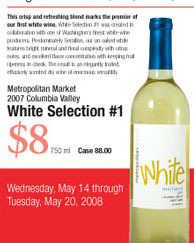 Two Buck Chuck is an obvious example but there are really dozens and dozens of copycat critter wines out there. The trick for Yellow Tail is thus how to succeed now that their Blue Ocean is turning Pink. Here’s a final Yellow Tail Tale that continues the focus on water. A third explanation for Yellow Tail’s success can be summarized in a single word: irrigation. Yellow Tail was made possible by the existence of enough water to irrigate the vast Casella and South East Australia vineyards. Water made it possible to grow grapes so efficiently that you could ship the wine half way around the world and sell it cheaply and make a fortune. But the environment is changing for Casella’s vineyards. It’s not Blue to Red, but wet to dry. Australia has experienced several consecutive drought years, which have caused vineyard yields to crash and changed the whole business model of Australia wine. Put simply, the plentiful cheap fruit that has fueled Yellow Tail’s growth is now just a memory. What is to be done? Casella seems to be considering several approaches. The first is conservation. According to their website, they have invested heavily in water recycling facilities, which will allow them to reclaim 400 million liters of wastewater each year for use in their vineyards. That’s a good start — and sustainable winegrowing is everywhere a concern — but I don’t think it will be enough to irrigate all the vineyards. So another strategy may be considered: outsourcing. There are many places on earth where inexpensive wine can still be produced. Will Yellow Tail consumers care if their wine comes from Chile, South Africa, France or maybe even Romania instead of Australia? My guess is that it won’t matter very much and that Yellow Tail may become a globally-sourced brand. Boy, that little wallaby gets around. But the long term threat to Yellow Tail probably isn’t water, it is wine. If Yellow Tail customers ever learn to like wine (you know — the stuff with tannin and acid?) then the brand’s days will be numbered! Until then, little critter, wallaby wine is safe.